ST. PAUL, Minn. — It was a trip that had been planned months in advance with no guarantee that David Hrenak would be playing in a game this weekend. It is one thing if your family lives a few states away. This required a flight across the Atlantic Ocean for Hrenak’s parents and three siblings from Povazska Bystrica, Slovakia, in Central Europe. So Hrenak had a little more on the line than many of his teammates last weekend in the NCHC quarterfinals. 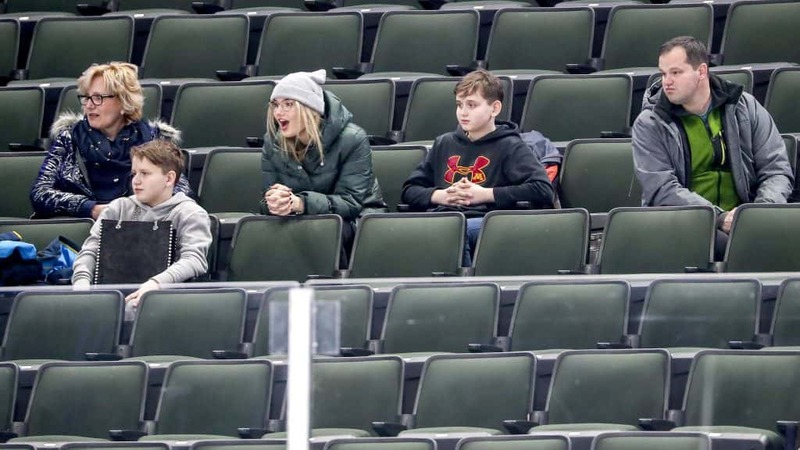 If the top-ranked Huskies had lost the best-of-three series to Miami, his parents (Jan and Maria), brothers Marko, 13, and Samuel, 11, and sister, Ema, 18, would have made a trip to Minnesota and not been able to see the 20-year-old sophomore play in a college game. 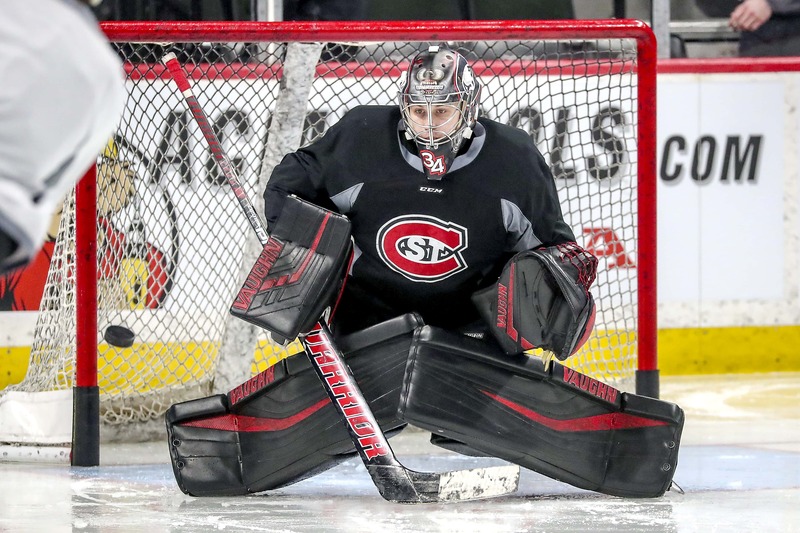 “I’m really excited that they have a chance to see me (play), especially on this cool rink,” Hrenak said of the Xcel Energy Center, home of the NHL’s Minnesota Wild. “This is their first time in the USA. It’s special. Before some sightseeing, the Hrenaks will get a chance to see David play twice this weekend in the NCHC Frozen Faceoff. The top-ranked Huskies (29-4-3) play Colorado College (17-18-4) at 4:08 p.m. Friday in the conference semifinals. If St. Cloud State wins, it plays for the championship at 7:38 p.m. Saturday. The third-place game is at 3:38 p.m. Saturday. The other semifinals game is between No. 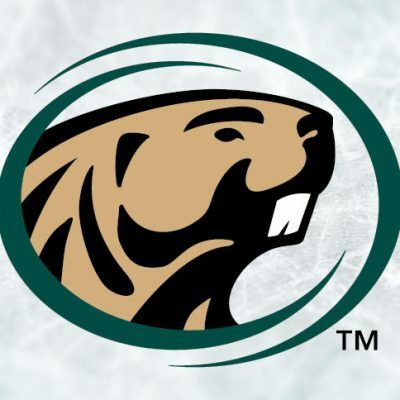 4 Minnesota Duluth (23-11-2) and No. 6 Denver (21-10-5), which begins at 7:38 p.m. Friday. 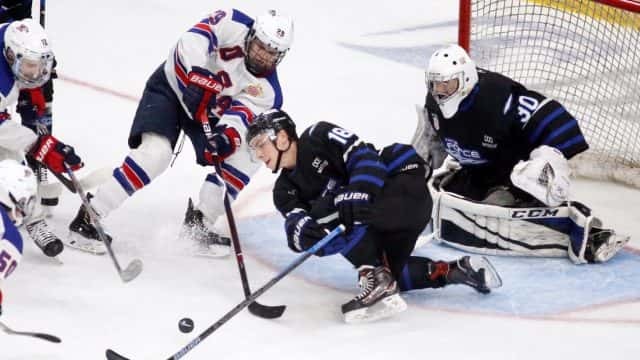 Hrenak, who has played on Slovakian national teams growing up, came to the United States in 2016 and played that season in junior hockey for the Green Bay Gamblers of the United States Hockey League. The last two seasons, he has emerged as the No. 1 goalie for St. Cloud. Not surprisingly, he is from a hockey crazy family. His mother is an elementary school teacher, his father owns a hockey equipment store, Marko is a forward on his hockey team and Samuel is a goalie on his hockey team. His three siblings all took a week off from school for the visit. So besides the hockey, what else do the Hrenaks have planned during their stay besides watching the Frozen Faceoff? Some of Hrenak’s statistics are not as clean this season as they were last season, when he was named to the NCHC All-Rookie Team. As a freshman, he was 14-7-2 with a .919 save percentage, a 2.11 goals-against average and three shutouts. This season, Hrenak is 22-3-2 with a .906 save percentage, 2.20 GAA and four shutouts and has been named to the All-NCHC Second Team. But those 22 wins are fifth in NCAA Division I and his .852 winning percentage leads the nation. Those last two numbers were something that Huskies head coach Brett Larson brought up with Hrenak recently. “We had a meeting about a month ago and the thing I brought to him was, ‘David, I have no idea how many goals and assists Jimmy Schuldt has,” Larson said of the Huskies’ defenseman, who is a top-10 finalist for the Hobey Baker Award for the second straight season. “But I know how he plays and I know what he brings every night. Hrenak admits that he had been critical of his own play before that conversation. “I just want everything to be perfect,” said Hrenak, a Los Angeles Kings draft pick who is listed at 6-foot-2 and 190 pounds. “I want to have wins and perfect numbers. I want numbers that are (the) best in (the) country. Maybe that was something: I was trying too much. But even when Hrenak has a bad game, it does not take long for his sunny disposition to take over. Schuldt and Patrick Newell, the team’s two Hobey Baker Award finalists, both had big grins when Hrenak was brought up in the team’s press conference Thursday. 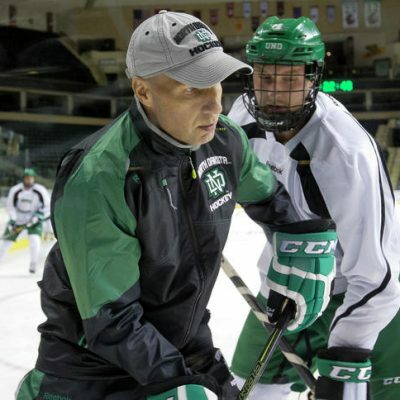 “I don’t think there’s a guy in the NCHC who smiles more than David,” said Newell, a smiley, upbeat senior from Thousand Oaks, Calif. “Every day you walk in, he’s always goofing around and always loving being out there. Hrenak has a tendency to say certain English words pretty regularly in conversation, something his teammates get a kick out of. “The amount of times he says, ‘Thank you’ for basically no reason is pretty cool,” Schuldt said with a smile. “He’ll be very selective when he speaks English and when he doesn’t.